Hector is a place where I like to go for having a “nice” lunch. It’s the definition of classy, good French cuisine. With a light and clear decoration, it always feels fresh and new to me when I enter. It is still one of the few places that presents a proper tablecloth and decent seating places. Their cuisine is quite refined, yet paying the most attention to the products used. 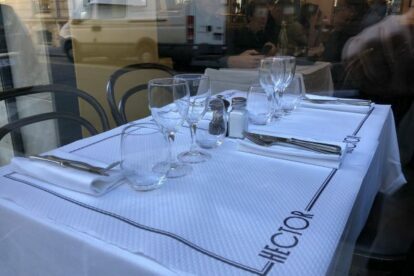 I went there recently and it was fully booked but they managed to accommodate the two of us at the zinc counter, which was nice, and thus we had a bit more privacy to talk about business. I definitely recommend this place for a nice lunch on a weekday, especially if you want to take some calm time and enjoy a break from the sightseeing. Their prices are not cheap, I know, but they quality of what you get is worth it.